The gene that produces blue eyes in a dalmatian also causes deafness. Blue eyes on a dalmatian make for a striking appearance. But blue eyes can be a warning sign. Find out if your blue-eyed dalmatian is genetically wired for hearing loss. Dalmatians are among the dog breeds prone to hereditary deafness. It's due to an auto-recessive gene that also affects the eye color, giving the dog blue irises. Dalmatians are the breed most frequently affected by the condition -- 30 percent of dalmatians have hearing loss in one or both ears. 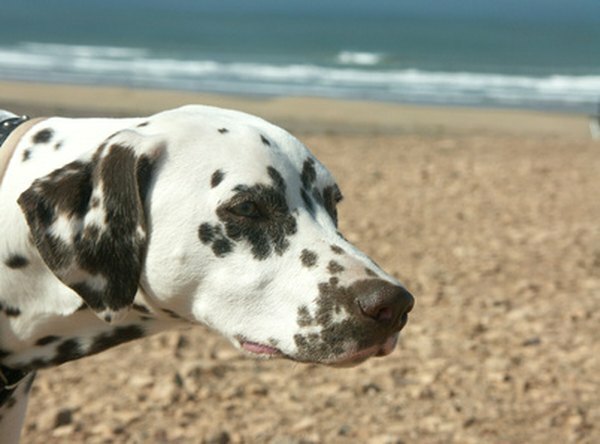 In their book on ear diseases in dogs and cats, Sue Paterson and Karen M. Tobias note that dalmatians with blue eyes have a higher rate of occurrence of deafness than dalmatians in general. 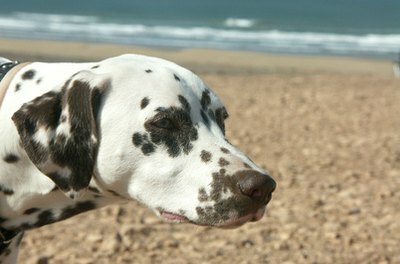 Initially you may attribute a hearing loss in your dalmatian as an obedience problem. If she begins ignoring your commands, though, it might be because she can't hear them. If your dalmatian appears confused by an order you've given her or if she moves her head irregularly, she is displaying classic signs of hearing loss. Any change in your pet's health should be brought to your vet's attention. The doctor can administer a hearing test, but you can perform simple tests at home that will tell you if your dalmatian has a hearing loss. Call your dog from another room to see if she can hear you. Shake a can of rocks or coins, clap your hands or ring a bell to see if your dalmatian responds. Sometimes, deafness caused due to an ear infection or an injury can be partially reversed. For dalmatians that have the indications of an auto-recessive gene, such as blue eyes, however, there is no medical treatment that will restore her hearing. If your dalmatian cannot hear, you'll encounter difficulty in training or signaling her with verbal commands. As an alternative, teach her to respond to hand signals, facial expressions and possibly some elements of American Sign Language. Other techniques may work: Try blinking a flashlight or using it to cast shadows that draw your deaf dog's attention, for instance, or stamping your foot on the floor. These methods have been known to work under the right circumstances. It will be necessary to keep your deaf dalmatian in a fenced yard, and she will need to be on a leash when on outings. She won't be able to hear an approaching vehicle or other danger, nor will your dalmatian be able to hear your voice when you call out a warning or command. Deaf dogs may fare better with companion dogs, from whom the deaf dog will take cues. For instance, the deaf dog won't hear your car arrive in the driveway or hear your keys rattle in the back door -- but she'll leap to her feet to greet you when her companion dogs hear you and dash toward the sound. From a glance at her companion dogs' behavior, she'll even know whether it's you coming in the door or a stranger. Do Blue-Eyed Cats Have Vision Problems? How Do You Know if a Dalmatian Is Deaf?